To view the flier for the event, please click here. Arlington, VA: Should parole be reinstated in Virginia? 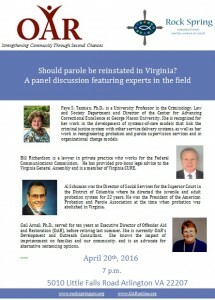 Members of the Virginia Commission on Parole Review, appointed by Governor McAuliffe last summer, will report on their findings at a panel discussion sponsored by Offender Aid and Restoration (OAR) and Rock Spring Congregational United Church of Christ in Arlington. The panel discussion will be held at Rock Spring Church, located at 5010 Little Falls Road, Arlington, Virginia 22207. The program is from 7 p.m. to 9 p.m. All are welcome. 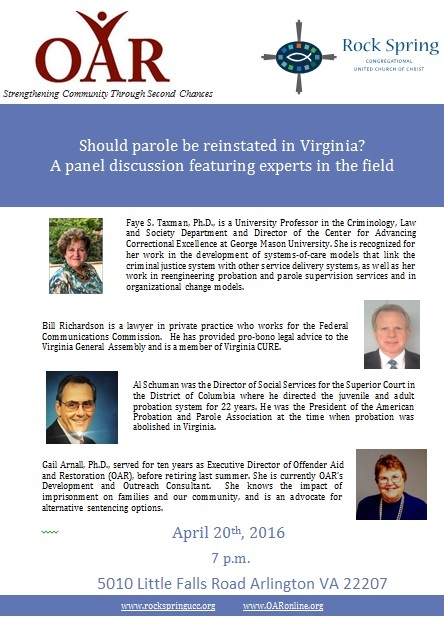 The panel will address many of the critical questions discussed by the Commission, and provide background information that is public, but often not known to or reviewed by the general public, including: What were the factors leading to removal of parole in Virginia 20 years ago? What have been the quantifiable impacts to Virginians by not having parole? What does the term “truth in sentencing” mean in the context of parole policies? What does the Virginia Criminal Sentencing Commission do in monitoring sentencing laws in the state? What is the typical length of sentence for various types of criminal charges? What alternatives to prison are available, or should be available? What are other states doing in terms of parole and sentencing reform? Faye S. Taxman, Ph.D., is a University Professor in the Criminology, Law and Society Department and Director of the Center for Advancing Correctional Excellence at George Mason University. She is recognized for her work in the development of systems-of-care models that link the criminal justice system with other service delivery systems, as well as her work in reengineering probation and parole supervision services and in organizational change models. Bill Richardson, who as a lawyer in private practice, participated in in several initiatives to bring about criminal justice reform in Virginia, and works for the Federal Communications Commission. He continues to be an advocate for common sense reform and has a unique historical perspective on the key issues from a legal point of view. Gail Arnall, Ph.D., served for ten years as Executive Director of Offender Aid and Restoration (OAR), before retiring last summer. She is currently OAR’s Development and Outreach Consultant. She knows the impact of imprisonment on families and our community, and is an advocate for alternative sentencing options. Al Schuman was the Director of Social Services for the Superior Court in the District of Columbia where he directed the juvenile and adult probation system for 22 years. Prior to that, he served as the Director of Youth Services for the District of Columbia Department of Corrections that included serving as superintendent of a correctional institution and parole supervision for all Federal Youth Corrections Act offenders. He was the President of the American Probation and Parole Association at the time when probation was abolished in Virginia. Copies of the Executive Summary of the recommendations from the Commission on Parole Review will be made available at the panel discussion. The full report and Executive Summary can be found at: https://parolecommission.virginia.gov/resources/final-report/2015-12-04-parole-commission-final-report.pdf. OAR, a community-based restorative justice organization, blends compassion and accountability to assist offenders in leading productive and responsible lives, to the benefit of all. Founded in 1974, OAR has served Arlington County and the Cities of Alexandria and Falls Church for over 42 years. OAR offers courses inside the Arlington County Detention Facility, and also works with individuals pre-release in various correctional facilities to help them prepare to return home. OAR offers reentry services to those who have been recently released, including emergency services, transitional services such as employment assistance, and intensive services for individuals who are at medium to high risk of recidivism. OAR also manages the court-ordered community service function for Arlington and Falls Church courts. In fiscal year 2015, OAR served 2,698 individuals.